Parenting style is one of the strongest influences on how a child drinks as a young adult, a study suggests. Independent think tank Demos studied data based on about 15,000 children born in the UK in the last 40 years. It found that a "tough love" style of parenting was the best way to ensure children drank more responsibly when they were aged between 16 and 34. The research also suggests that being too authoritarian with children could be as ineffectual as being too casual. Researchers found that the best approach was for parents to be warm and affectionate until the age of 10 and then combine this with more discipline. Then at ages 15 to 16 there should be more supervision. It found high levels of parental attachment when children were aged under five significantly reduced the chances of them drinking excessively later in life. It studied data gained from questioning of parents on two broad areas - warmth and discipline. When their children were young, parents were asked about how much time they spent with them and whether they ate meals together, among other questions. Regarding discipline, they were asked whether they knew where their teenage children were in the evenings, how often household rules were broken, and other questions. When the children reached adulthood, they were asked about alcohol consumption. Report author Jamie Bartlett said that parenting which combined high levels of both warmth and discipline "results in the child overall in their lives achieving lots of positive things - well-being, responsibility, efficacy, and responsible alcohol consumption is one of them. "This isn't just about alcohol, but it's one of those things that's affected by parenting styles." Demos's study found bad parenting at 16 made children more than eight times more likely to drink excessively at that age and over twice as likely to binge drink when they were 34. Its report says parents should discuss alcohol with their children and set firm boundaries on drinking, avoid being drunk around them and actively ensure they develop sensible expectations of consumption. It says ensuring teenagers do not have easy access to alcohol at home and monitoring drinking in the home environment is another important element of a tough love approach. Those difficult moments of enforcing tough rules really do make a difference, even if it doesn't always feel like that at the time. The think tank recommends that parents take a lead role in dealing with "an entrenched binge drinking culture" in Britain with government support. The government should enforce under-age drinking laws - in partnership with local authorities and retailers - so that alcohol boundaries are clear, it says. 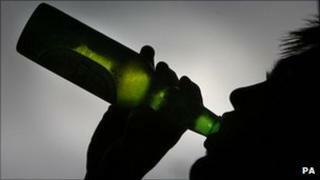 Investment should also be made in alcohol-related school programmes involving parents, the report says. Activities for at-risk children are also important during school holidays when there can be more opportunities to engage in binge drinking, Demos says. Mr Bartlett said the impact of parenting on children's future drinking "cannot be ignored". "This is good for parents: those difficult moments of enforcing tough rules really do make a difference, even if it doesn't always feel like that at the time." Data used in Demos's study came from the 1970 British Cohort Study.